Memphis is three years too late with the investments that give every child a fair start in life. That’s because public spending on education essentially ignores the first three years of a child’s life, and that’s the time when most of his brain is being developed. A child’s brain doubles in size in the first year, and by age three it has reached 80 percent of its adult volume. However, according to a recent study here, “In Shelby County, less than 2.5% of all public investments at all levels (of education) go to children under the age of three.” It’s a stunning conclusion and one that should change our focus to the early years when a child’s brain is wired to learn. This chart shows how our brains act as sponges as brain growth skyrockets in the first three years of life. It’s why we say that every parent must “Touch, Talk, Read, Play” with their children to make the most of this dynamic time in their development. Twice as active as our adult brains, these children’s brains are soaking up everything around them and growing rapidly, building the foundation for cognitive and character skills necessary for success in school, health, career, and life. And yet, because of fragile families, stress, uncertainty, poverty, and negative experiences, too many of Memphis’ children start out behind their middle class peers. The children of teenage mothers start farther back still. The conventional wisdom is that once our children enter school, the playing field is leveled and that’s when the greatest impact can be made. Conventional wisdom is wrong. 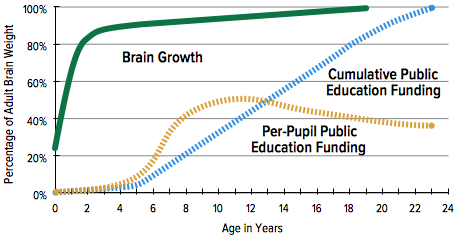 The greatest impact is when children’s brains are rapidly growing and this graph shows the rate of return during a child’s education. 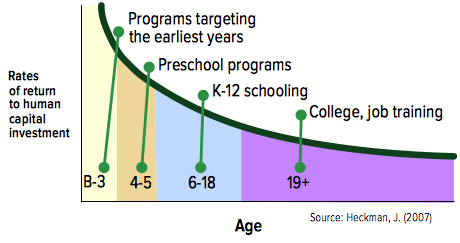 As shown on this chart, the return on investment for children from birth to three years of age is dramatic. There is no smarter investment we can make in Memphis than in early intervention. But that’s not what we’re doing. We’re not spending the amount of money to make sure children have optimal brain development and are ready for school. High-quality investments in early childhood can close the achievement gap that occurs when some children have an unequal start in their lives. This graph tells the story about the economics of human potential: invest more earlier for the greatest impact on the lives of our children. These are investments that make children more likely to finish high school, have better health, avoid criminal behavior, and provide for their own families in the future. It’s an equation where science and common sense converge. We all know that the best actions that we make are when they can have the most positive impact. For Memphis, that’s getting serious about investing in children from birth to three years old.